It’s usually in times of great challenge that you learn the most. Well, let’s just say that in the last few weeks I have learnt a lot. Work has been challenging and stressful in the past few weeks. Mostly due to difficult stakeholders. I've had lots of reassurances from my bosses that I have been doing my job well. And yet...I worry. I worry that it's not good enough, that I'm not doing enough. I worry that something will go wrong. I thought I'd share a couple of lessons I've learnt. Everyone has struggles, so who knows, it may be helpful in your life right now too. Trying to control the uncontrollable only depletes you. It steals your energy faster than you can refuel. Prevent massive energy leaks from happening by letting go of what you can't control. I can get my tasks done with all that worry and "noise" in my head, or... I can just get my tasks done. Focus energy on things you can control and make you happy. Worrying doesn't actually achieve anything. Neither does complaining. Spending your limited energy in a different way helps you regain purpose. Being less depleted means you can be more strategic. You might even see opportunities you previously missed to be happy! So on that note, I decided to choose happiness and focus my energies on making dessert for breakfast! 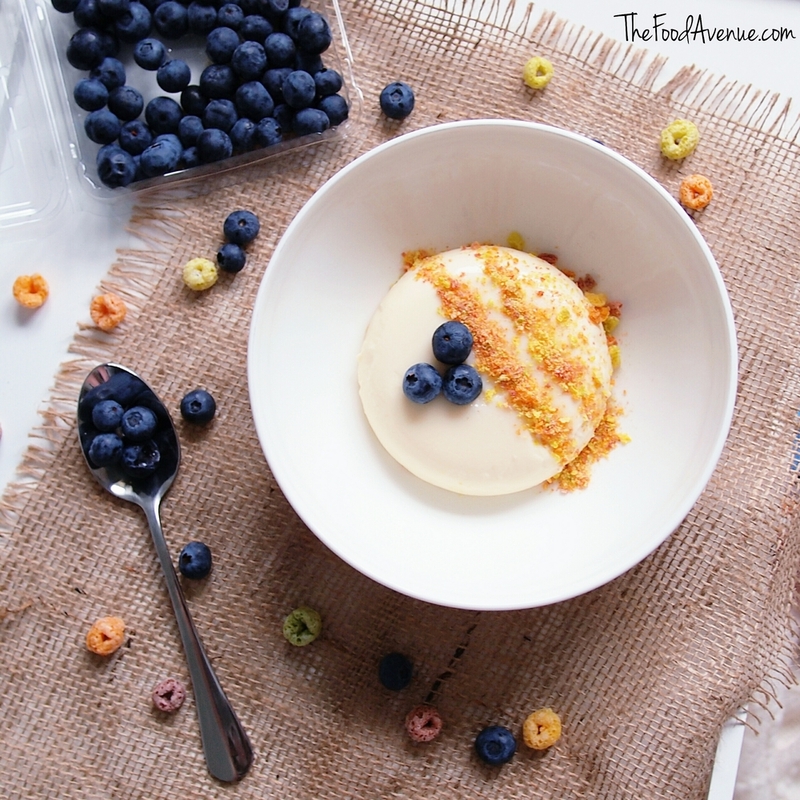 Inspired by Momofuku Milk Bar's cereal milk, here is my Cereal Milk Panna Cotta recipe (adapted from Trissalicious' recipe). Steep the cereal in the milk and cream for 30 minutes. Strain and reserve the cereal milk. Add the sugar and salt to mixture and heat up in saucepan. Wring out gelatin and add to saucepan. Heat gently to melt the gelatin. Pour into molds and chill in fridge until set. Serve topped with crushed cereal and fresh blueberries.